Jack and Precious were surrendered to the shelter when their owner went to a nursing home. End-of-life care. What a difficult topic, whether it involves humans or pets. On any given day, if you were to walk around the adoption floor at the Lycoming County SPCA, what would you see? Probably a large number of younger pets, full of vim and vigor. They tend to get adopted quickly. But, there on the outskirts, quiet and subdued, you can find a handful of “Golden Oldies.” They patiently sit and wait, trusting that their new forever family will be coming soon to get them. These gentle old souls tug at our heartstrings. Often, they are here after living a lifetime with their previous owners, who, due to old age themselves, went to live in a nursing home or passed away. 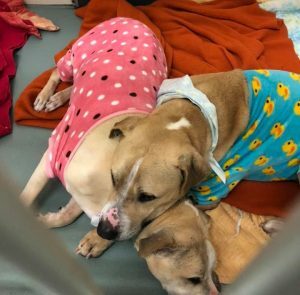 The staff does their best to make sore joints and achy backs comfortable on the kennel beds, but nothing is a substitute for a warm and loving home. 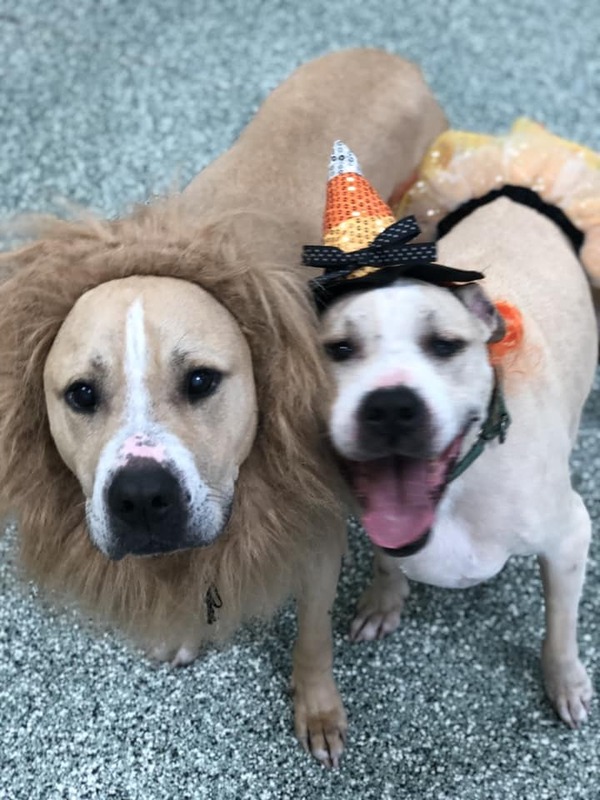 Jack and Precious in their Halloween costumes. Jack and Precious have come to us from just such a situation. A bonded brother and sister pair from birth, the pets lived for eleven years with their previous owner until he could no longer care for them. He was placed in a nursing home and the dogs came to the shelter in February. They have been with us for 10 months now, celebrating their 12th birthday here (complete with balloons and cake, of course.) Clocking in at about 77 human years, the dogs are being treated with top-notch medical care while they are here, but our resources can only go so far. Their chief old age complaints consist of lumps and bumps, a special diet, and occasional medicated baths. 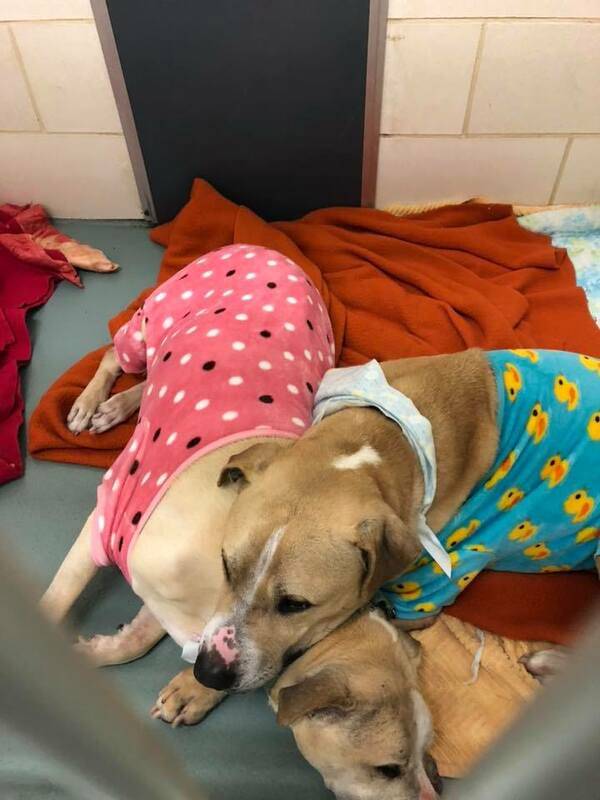 They go for walks together and volunteers have dubbed them “The Babies.” While considerable effort has been put forth to secure them a new home, the two are still waiting. 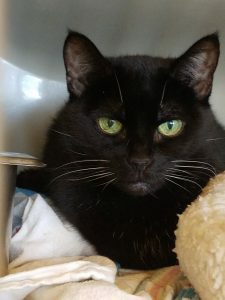 Thirteen-year-old Gizzy has been surrendered to the shelter twice in her lifetime. Gizzy comes from a similar background. She was first surrendered to the shelter in 2014 due to the health of her owner. Four years later, she had the same situation occur and arrived back at the shelter. The thirteen-year-old lady loves nothing more than to cuddle in her snuggly bed and blankies, watching the world go by. 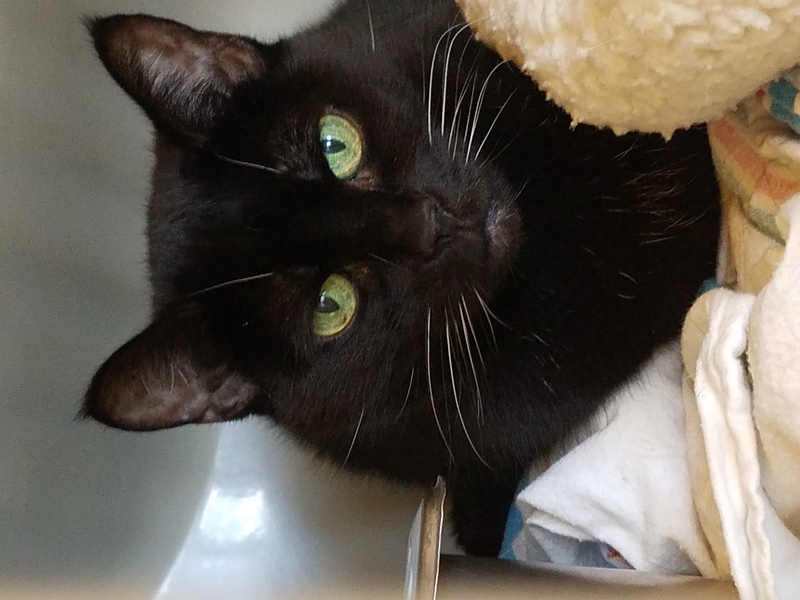 Her quiet and retiring nature, as well as her black fur, does not attract many potential adopters. They tend to pass her by in favor of more boisterous kittens down the row. She has now spent the last seven months hunkered down in her pen, and while staff does their best to make her life pleasant, nothing beats a home environment. 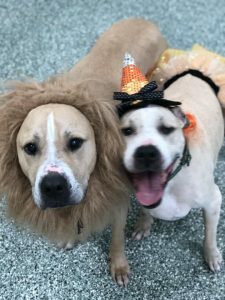 While these stories might seem sobering, SPCA supporters have already made a positive difference in the lives of these senior pets. They provided a place for the owners to turn to in their time of need and have given the pets a safe, loving environment while they wait. Jack and Precious and little Gizzy have a loving home here for as long as they need it. As this #GivingTuesday approaches, will you consider giving so that senior pets like Jack, Precious, and Gizzy have a second chance at life?